it started with columbus. 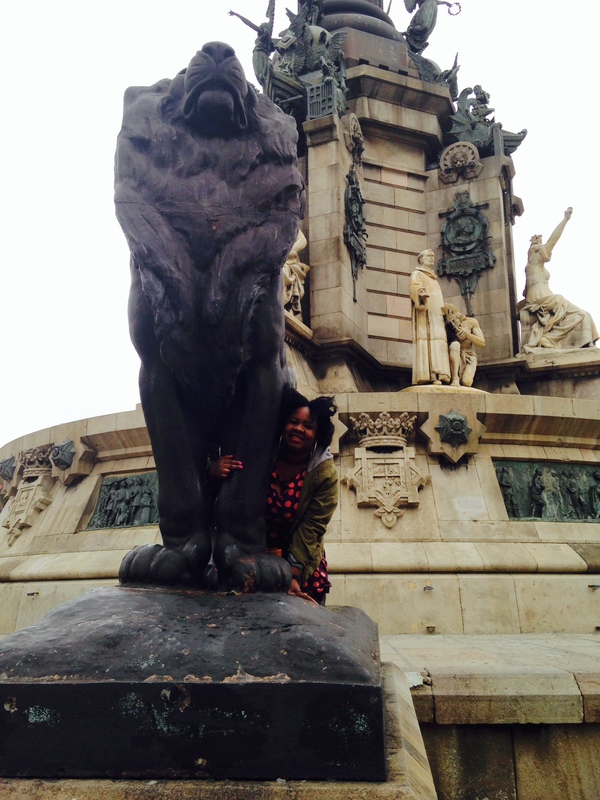 barcelona, a city within a nation that owes a lot to the exploits of christopher columbus, has an expansive, beautiful monument to that person and I wanted to pose with one of the lions featured. I’ve always loved/intensely feared lions. I dream about them constantly. those dreams turn into nightmares frequently. I low-key believe in reincarnation and I am certain that in one of my past lives I was a male lion. anyway, I love lions. but I hate european imperialism. and colonialism. and the fact that millions of people across continents are organized around a handful of european languages—spanish and english, mainly. the lion near the statue to columbus in barcelona. so, after I took my picture with one of christopher’s lions, I felt really dirty. like, why am I supporting, in my own way, the violence and thievery and misery that this nation, aided by this man, wrought in north and south america? there’s a lot of those emotions for me, a black american, traveling in europe. for every beautiful structure, every magnificent statue, there’s a nagging sense that I shouldn’t worship these cultures that have taught the world to worship them. that there’s a very ugly past to every great empire, france and its idealistic revolution included. in berlin, which is one of the few western european countries to even attempt to deal with its legacy of systemic and state-sanctioned racism in any sort of public and meaningful way, it struck me that the majority of tourists were from places that had been colonized and from cultures that had survived a forceful diaspora. we, people who could not, in any sort of way, inherit in any meaningful way, the dynastic power embodied by big, classical buildings and important looking white dudes, were snapping away with cameras and posing next to figures of people who, at best, didn’t think we were as human as they. it’s an issue that I haven’t really resolved for myself because its a big, mushy, complicated issue. for me, at least. what about you: do you ever feel a way about your involvement in the legacy of imperialists? I’m not the world traveler that my sister is, but I often feel this way about the history of my college and law school. They often post TBTs of white men in the 50s and before, and later white women, attending class on the lawn, playing football or going on a class trip. I like the pictures, then instinctively feel like some type of deviant because my grandparents, and even my parents to some extent, were excluded from that key piece of the American dream. yes! it’s that double consciousness thing that we are always dealing with, at home or abroad. Yes…every time I head out into the desert around Phoenix. Or look closely, deeply, at the name of my city and the towns around me: Chi-CA-go, Mil-wau-KEE, Ott-O-wa. I feel this way not because of what’s there but because of what’s missing or pushed so far into the recesses that it may as well be invisible: Native Americans. Chicago owes its own name to the French interpretation of an Illini word for “stinky swamp onion”. The French still exist but the Illinois tribe is long gone. I’m sitting here reaping the benefits of English & French colonialism hundreds of years later. I don’t think about it much when traveling in Europe..I’m white, of Western European descent so the statues, the monuments, feature people who closely resemble me. It’s easier to see them only as pretty, benign tourist attractions. When I’m in the country of my great grandmother’s birth – Ireland – I get all pissy at the English. Thank you for posting your thoughts. It’s a good thing to be reminded that “history” isn’t the same for all of us just because we’re all standing in front of the same monument…and monuments are never “benign” – why else would they have been erected? very, very true! I think, for me, I’ve dealt more effectively with the racism and misery and murder and everything horrible that is the foundation of english/spanish-speaking life in north america. dealing with it in europe was a different thing all together. Previous Previous post: done. done. done. done. doing.